When the Good Friday Agreement was signed in 1998 the possibility that the United Kingdom would one day vote to leave the European Union was not even a consideration. The fact that the GFA allowed people in Northern Ireland to identify as British, Irish or both was important but regarding the totality of relationships across the islands, Irish and UK membership of the EU, while understated, was undoubtedly as signicant. Whilst northerners who aspired to Irish unity quietly acknowledged that it was unlikely to materialise in the short to medium term, southern society was largely settled and happy with their lot. The GFA laid out plainly how constitutional change could happen. What this meant in simple terms is when it seemed possible the majority of people in NI would support unity then the British government would grant a unity referendum, a border poll. However the result of the UK EU referendum has raised the prospect of constitutional change happening sooner than previously thought. In June 2016 56% of people in NI voted to remain in the EU but the majority in the UK voted to leave. Those who voted to remain along with many who voted to exit are now wondering two things; what happens next and is the time for a border poll now approaching? The possibility of a border poll being called following the planned conclusion of Brexit in March 2019 has undoubtedly increased. In the event of over 50% voting in favour of unity, the north will re-enter the EU as part of a new unitary state. The promise of re-entry to the EU alone may not to be enough to secure a win for those in favour of unity. So what can be said and done to convince enough people in NI to vote for a new Ireland with no border and within the EU? People will decide which way to vote in a border poll based on a number of factors; Brexit, the economy, health, education and identity to name a few. A Joint Oireachtas Committee on the Implementation of the Good Friday Agreement recently published a landmark report titled ‘Brexit and the Future of Ireland: Uniting Ireland and it’s People in Peace and Prosperity’. It is a report that aims to highlight the economic and social opportunities that have arisen for the entire island of Ireland in the wake of Brexit. It states that the majority of people in Ireland, north and south, want to remain in the European Union and that this can be achieved through a new Ireland. It focuses on the huge challenges facing NI when it leaves the European Union and shows that Northern Ireland is currently ranked 44th on the UN Human Development Index but is set to tumble to below 50th position after Brexit, leaving it alongside countries such as Kazakhstan and Belarus. The UN Human Development Index examines three factors: health, education and income. The south of Ireland is currently ranked 8th in the world in this index next to Germany, the US and Canada. The report stated that if a border poll was held tomorrow and delivered a result in favour of Irish unity the expectation would be that the six counties in Northern Ireland, as part of a new state, would jump from 44th to join the rest of the island in 8th position. The timeframe would largely depend on the rate of investment and programmes established to assist with jobs and education. Other southern voices have added to the conversation including Dublin-based journalist Fintan O’Toole who stated that ‘Brexit is the catalyst for fundamental change’ during a discussion at this summer’s Féile An Phobail. For the first time in their history, Fianna Fáil is currently in the process of composing a white paper on Irish unity. The party leader Micheál Martin commented, ‘The remain vote may show people the need to rethink current arrangements. I hope it moves us to majority support for reunification, and if it does we should trigger a reunification referendum’. Significantly on his recent visit to Belfast, An Taoiseach Leo Varadkar spoke about the requirement to build more bridges and fewer borders. It is the changing nature of this southern commentary that is most striking in the overall debate about the future of Ireland and in particular the prospect of Irish unity. Free health care via the health service is often cited as a reason why people in NI might choose to stay within the UK. The perception, whether true or not, exists that there are major differences between the health service in the north and the health service in the south. At €14.6 billion (£13.3 billion) the budget for health per annum works out at approximately €3,100 (approx £2,800) per person in the south. At £5 billion the budget for health per annum in the north works out at approximately £2,700 per person. The southern government, it appears, is spending more per capita on health than is spent in Northern Ireland. Does the opportunity exist for the development of an entirely new health system, which when factoring in duplication of services could be more efficient than what is currently on offer on both sides of the border? When it comes to education Brexit will deny students from NI the chance to go on an Erasmus programme and will deny the 3,000 EU students we currently attract annually to NI the chance to come and study here. They contribute approximately £40 million per year to the local economy. It threatens the 1,400 university staff from other EU states who live here and share their knowledge and expertise with us. Our universities will cease to receive necessary EU research funding when we leave the EU. Queen’s University Belfast alone, has received in the region of £60 million from the EU since 2011. Education suffers under Brexit. Is the British government prepared to replace these EU funds and more from their own exchequer? The subvention figure is another reason cited why people in the north might choose to stay within the UK but the subvention figure has never been properly explained, in detail, down to the last penny, to the people of NI. In advance of a border poll the British government must break down the subvention figure and explain it piece by piece. People have a right to know. According to a rapporteur of the recent Irish government report, senator Mark Daly, The Nevin Economic Research Institute has said it cannot find hard economic data in relation to NI. When you don’t have access to hard economic data it is almost impossible to make good policy decisions. The United States Congressional Research Service was asked by Congressman Brendan Boyle to examine the subvention figure and concluded that they simply couldn’t work out the running costs of NI. Included in the running costs of NI is its contribution towards the costs for 11 nuclear submarines with an additional 4 under construction, 215 nuclear missiles and 3 aircraft carriers also currently under construction that cost approximately €3 billion each. In a new Ireland these costs would disappear. NI pays its share of the interest payments on the UK’s national debt. The interest is a growing figure but currently sits in the range of £40 billion per annum. In a radio interview with the BBC’s William Crawley on 10th August 2017, Senator Mark Daly commented that, ‘Northern Ireland also pays its share of the £2 billion for what the government calls ‘indeterminable expenditure’ which the British government either refuse to tell us how this money is spent or incredibly, they don’t know’. London does not reveal the income tax take total from NI, nor have they told us the inheritance tax total or the corporation tax total. This money is simply pooled. In advance of a border poll we need facts and figures from the British government. We need to know exactly what NI raises and exactly what it spends. We need the true costs. We need to know upon what London spends our money. We need to know what the subvention figure actually is. In terms of the switchover costs associated with a potential new Ireland it is expected that these costs would be met largely by the British government and the European Union during any transitional period and subsequent early years of the newly formed state. One example might be if a public sector worker in NI is due a government pension when they retire, having paid into the British system for a number of years, then the British government will be expected to fulfill that obligation. Irish economist David McWilliams has reported Ireland’s economic fortunes have changed drastically since the time of partition. He noted that one hundred years ago the north was affluent and the south struggled to assert itself economically. McWilliams commented, ‘It is unfashionable to say it, but the Union has been an economic disaster for both tribes in Northern Ireland. If we go back to 1920, 80% of the industrial output of the entire island of Ireland came from the three counties centred on Belfast. This was where all Irish industry was. It was industrial and innovative; northern entrepreneurs and inventors were at the forefront of industrial innovation. By 1911, Belfast was the biggest city in Ireland, with a population of close to 400,000, which was growing rapidly. It was by far the richest part of the island’. He continued, ‘Fast-forward to now and the collapse of the once-dynamic Northern economy versus that of the Republic is shocking. Having been a fraction of the North’s at independence, the Republic’s industrial output is now ten times greater than that of Northern Ireland. Exports from the Republic are €89 billion while from the North, exports are a paltry €6 billion. This obviously reflects multinationals, but it also underscores just how far ahead the Republic’s industrial base is. Producing 15 times more exports underscores a vast difference in terms of the globalisation of business’. McWilliams also comments that the average wage in the south is approximately €40,000 while the average wage in the north is around £22,500 (€25,000) a whopping sixty per cent difference. Regarding social security payments, the weekly jobseekers amount payable to those over the age of 26 in the south of Ireland is €188 (£171). In the north it is £73 for those aged over 25. 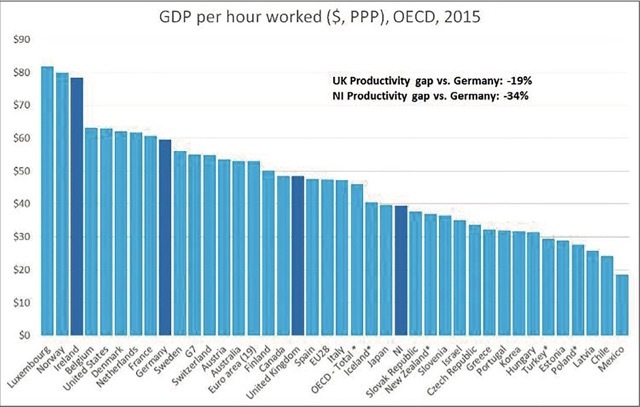 Regarding productivity, Jordan Buchanan, an economist at the Ulster University Economic Policy Centre tweeted on 29th November 2016 an image of the graph below, showing that in 2015, what NI took almost two weeks to produce the south of Ireland produces in one. It is becoming increasingly evident that partition has held back, and continues to hold back the true potential of the economy, north and south, with the north in particular feeling the negative effects. Do we want an economy which is low wage, low value jobs, low productivity and young people emigrating in signicant numbers or do we want an economy which is attracting investment on the same scale as the south and boasting world-beating rates of innovation? When Northern Ireland is compared to regions in Britain, it shows NI towards the bottom of almost every economic league table that is produced. the table for household spending power behind regions like North East England, West Midlands and Wales. 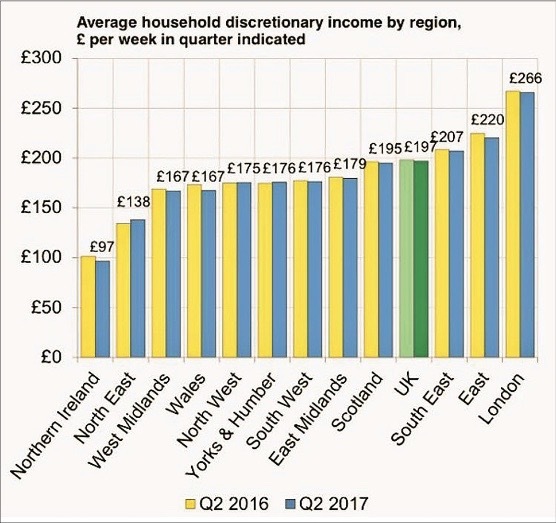 Whilst households in NI have £97 left over after bills are paid each week, households in Scotland have £195 and the UK average is £197. Bottom of a league you’d like to be top of. 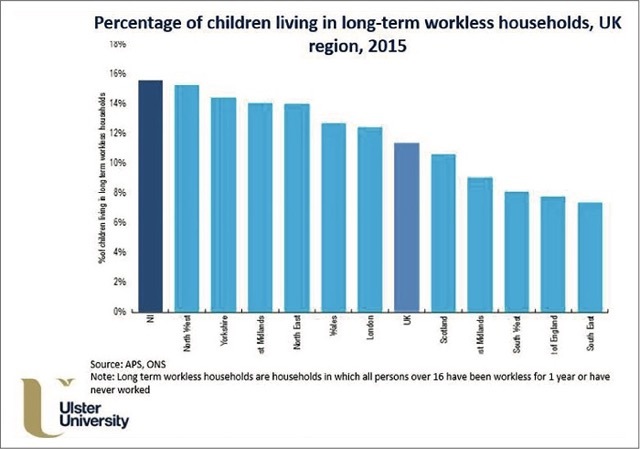 When it comes to issues like the number of children living in long-term workless households, NI is the highest in the UK. 60,000 children, almost 16% of under-16s in NI living in long-term workless households. Top of a league you’d like to be bottom of. 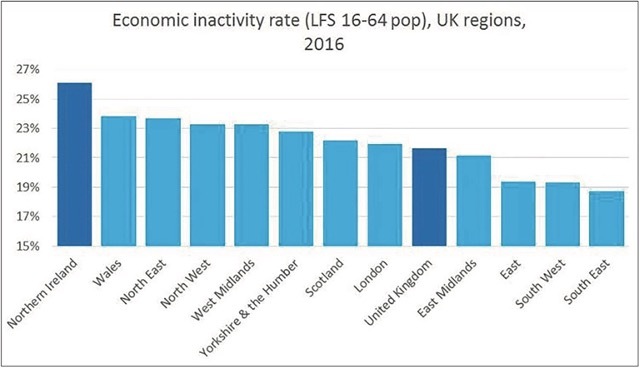 Regarding economic inactivity in 2016 Northern Ireland had the highest economic inactivity rate when compared to regions in Britain and the lowest employment rate. See both graphs below, tweeted by Jordan Buchanan of Ulster University Economic Policy Centre on 15th February 2017. Ulster University Economic Policy Centre also revealed on 31st July 2017 that the average NI housing related expenditure is £73 per week, less than half the amount in the UK at £165 per week. It represented just 12% of total expenditure compared to 22% average in the UK. 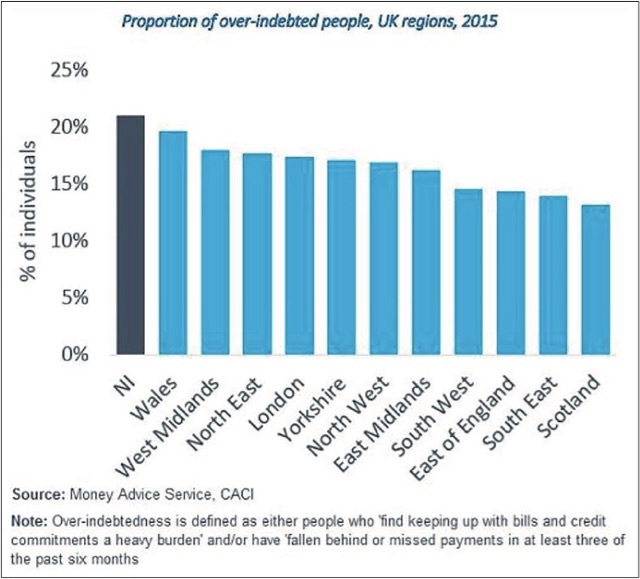 The same economic research centre also reported that more than one in five people in NI are over- indebted, higher than any incidences of over-indebtedness in the UK. More people are in debt because Northern Ireland is not serving them well, over 20% of the population ‘ find keeping up with bills and credit commitments a heavy burden’ and/or have fallen behind or missed payments in at least three of the past six months. On the same day the Economic Policy Centre also announced that the workforce in NI had not had a pay rise in real terms in over a decade and that real household income had actually fallen since 2008/09. So across the board, and even before Brexit in March 2019, trends do not augur well for the north’s economy and whilst Northern Ireland has many renowned entrepreneurs and industrialists, the facts remain that it is a consistently poor performer when compared to regions in Britain. A FUTURE OUTSIDE THE EU? Our economic future with Brexit on the horizon does not augur well. The negotiations are unlikely to conclude as the UK government would wish. The other EU member states will not make this an easy exit for the UK. Even before the EU referendum multiple reports carried out by credible and reputable organisations like PWC and Oxford Economics in relation to the effect of Brexit on the UK by the year 2030, concluded that it would result in a negative impact on the Gross Domestic Product of the entire UK. One of the reports produced by the Centre for Economic Performance suggested the decrease in GDP could be as much as 7.9%. Another report by Her Majesty’s Treasury, the government itself, predicted as much as a 7.5% decrease and the National Institute of Economic and Social Research claimed it could negatively impact on GDP by as much as 7.8%. Northern Ireland is a net beneficiary of the EU and dependent on the terms of the exit stands to lose almost 1 billion euros in structural funds and 2.5 billion euros in Common Agriculture Policy Funding. In March 2017 PWC forecasted that the NI economy would have poorer growth than any region in the UK for both this year and next. In many respects there is a challenge now for those who want us to remain outside of the EU, inside the UK and on a divided island with an economic border. Can they convince us that Northern Ireland, already at the bottom of almost every economic league table, will not become an even weaker economy that it currently is? A FUTURE IN A UNITED IRELAND? The EU has said NI can rejoin the EU as part of a new Ireland if a border poll delivers a yes result. The north would then, like the rest of the island, use the Euro as its currency. The south of Ireland has changed dramatically since partition. In the past number of years Irish society has progressed in a way that would once have been thought impossible. The current Taoiseach is the personification of that change, a gay man from an Indian background. If, like for many people, it comes down to pure identity then those who are British will have their culture and identity fully protected in new constitutional arrangements. A northern assembly with autonomy could be part of a new agreed Ireland. The desires and wishes of those who cherish their British identity must be respected and legislated for in a new constitution. We must ensure that every tradition is valued in a new state. It is clear there are many opportunities for us all in a new, borderless Ireland. Opportunities that are being denied, not just by the current constitutional arrangements but also by leaving the EU and opportunities that are presented by new, fresh, exciting constitutional arrangements. We have an opportunity to make the vision for the future a reality. We must work together as a community and as an island to ensure that vision becomes a reality in the near future. August 25, 2017 in News & Current Affairs. Jasus I knew we were near the bottom of the list when it came to any kind of business, education, expendable income, jobs etc, etc, the list goes on and on but I had no idea how much of an utter failure this place is. I really, really hope the PUL population read this article and think of their children’s future instead of their own past. They have protection on every front including a regional parliament. I’m tempted to say it’s more than they deserve or would have given to ‘the other side’ but I’m of an age where I lived here pre troubles and am still angry at the treatment that was levelled at another part of the community. I try instead to think like my grandchildren…..’the war is over Nana’! There really is a way forwa d for ALL of us. No one is going to get everything they wanted…..a shared future. So, think of the future……a new Ireland, for us all. The only thing Dr leo varadkar, himself an MD, has to do is introduce immediately a “free at point of care” health system in the ROI, just as they have in many other EU countries. Nothing else for the moment. Just find the money in his budget to cover the costs for GPs. 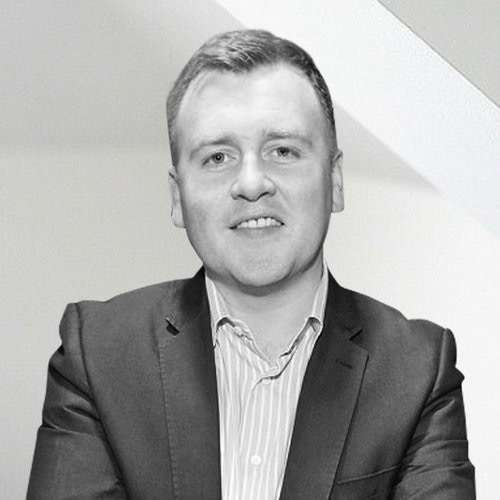 Excellent article – thank you Gerry for creating it and to Eamonn for re-tweeting it. There is an ugly English/British jingoism raising it’s head during this “Brexit” process, a process that has the potential to harm Ireland’s National interests. All parties in Ireland need to fully understand that party political agendas cannot override Ireland’s National interests – this is a pivotal l period in Irish history and it is absolutely imperative that all of Ireland’s best interests are asserted and protected. The NeVin institute says the North has £3.5 billion of annual sales to the Republic, but £12.5 billion sales to Britain, so trying to stay in the EU Single Market when the rest of the UK departs would risk economic self harm. The Irish Government no longer use Irish GDP as an economic measure since it was being called Leprechaun Economics by the rest of the world. So all the parts of this using Irish GDP are completely inaccurate. The FT says the Irish economy is about a third smaller than expected using the new metric GNI. The country’s current account surplus is actually a deficit. And its debt level is at least a quarter higher than taxpayers have been led to believe. I posted a link above that shows £12.5 billion in sales to the UK which are not counted as exports for NI, but worse than that. Just one of the multi nationals contributed 17 billion to Ireland’s exports and they don’t manufacture or sell anything in Ireland. They just booked all their European sales and Australian Sales through their Irish Office. That won them the award of Irish Exporter of the year 2014 when all they did was book the sales for tax reasons. So to get a fair measure of the Republics Industrial base v Northern Ireland you need to take away all the money booked in Ireland for tax purposes by multi nationals and add £12.5 billion on to Northern Ireland. A step beyond a third world state living off the spoils of others. Brilliant article that focuses on facts and not myths. It also leaves the indigenous language out of the debate, often used as a political football by those who for the most part can’t even speak it. New Ireland, supportive of all cultures, respective of histories using a forgotten flag of peace (tricolour), is the only way forward. Let the real healing begin, and the national identity grow to be the respected nation it can be, as one. As stated above by the Nevin Institute NI sells £12.5 billion to the rest of the UK and £3.5 billion to the ROI. We also export £2 billion to the USA/Canada. So a paltry £6 billion can’t be right.